After being pushed out of its original December 20, 2013 release date last year, Sony Pictures has issued a November 14 release date for Foxcatcher, which stars Steve Carell, Channing Tatum and Mark Ruffalo. The drama from director Bennett Miller will be going up against Relativity's Blackbird, Universal's Dumb and Dumber To and Sony's Fury. 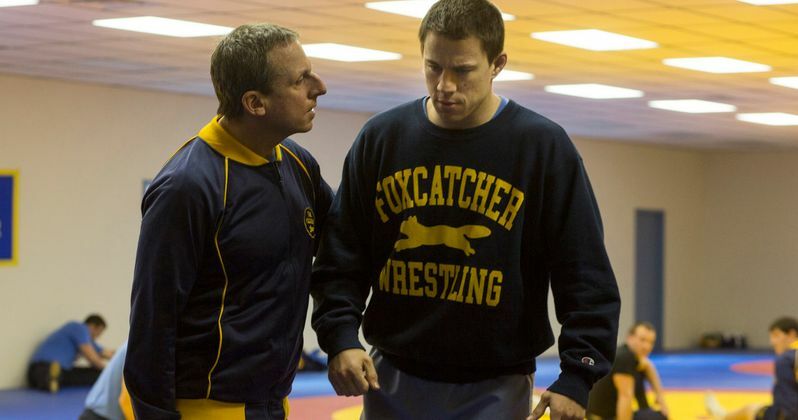 Foxcatcher was considered to be an award season candidate when it was initially slated for release in December, depicting the true story of Jon Du Pont (Steve Carell) the unstable heir to the Du Pont chemical fortune, and his relationship with Olympic wrestlers Mark Schultz (Channing Tatum) and Dave Schultz (Mark Ruffalo) which lead to a tragic murder. Mark Ruffalo, Vanessa Redgrave and Anthony Michael Hall co-star. In related news, Universal Pictures has issued a December 18, 2015 release date for The Nest, starring Tina Fey and Amy Poehler. The comedy will go up against Disney/LucasFilm's highly-anticipated sci-fi sequel Star Wars: Episode VII and Sony's Inferno. The story centers on two sisters (Tina Fey and Amy Poehler) who throw a huge party in their childhood home before it is sold. Jason Moore (Pitch Perfect) is directing from a script by Paula Pell.